This is THE BEST idea I've seen for learning to play piano for absolute beginners. Think of Synthesia as Guitar Hero for piano... only better. You hook up a real MIDI keyboard and the "piano roll" drops notes. You play the game and make real music. The better your score, the better you are, and it's as simple as that. Synthesia is free, but when you're ready to learn to read sheet music, you can buy a "learning pack" to have Synthesia display sheet music to scroll it over the piano roll. Any MIDI file works as input. This doesn't teach you music theory. It won't replace music lessons, if you're inclined to write your own music or want to understand musicians when they talk among themselves. What it DOES do is allow you to learn on your own to be comfortable playing specific songs. You then apply that experience to new songs, and -- given a little talent -- eventually you're a pianist. Synthesia is available for Windows XP, Windows 7, or Mac. The Windows version works flawlessly in Linux under WINE. As a matter of fact it's got the best multi-monitor screen handling of any program I've tried in WINE. There is practically no lag on my cheap laptop. My piano and Synthesia sound the notes in unison. You don't HAVE to have a MIDI piano -- the game will map your computer keyboard -- but it's much better if you have the real thing. Just put your laptop or monitor over your piano, plug in the MIDI cable, and you're ready to go! 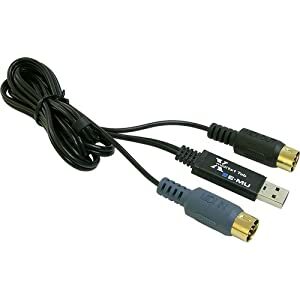 I use an M-Audio 1-in/1-Out USB-powered adapter cable to connect my piano keyboard to my USB port. It's about $50 from the manufacturer, but search for it on Google Shopping and you can find them as cheap as $31. I should point out, though, that the Synthesia website reports that this adapter doesn't work for everybody. They recommend the EMU XMIDI 1X1 USB MIDI Interface instead, available at Amazon.com for $29.95. i've been using the ebay el-cheapo version of this cable and together with the Learning Pack, it has dramatically improved my note-reading ability. Well worth it. The Guitar-Hero mode I think is not worth the time if you are serious about learning the piano.